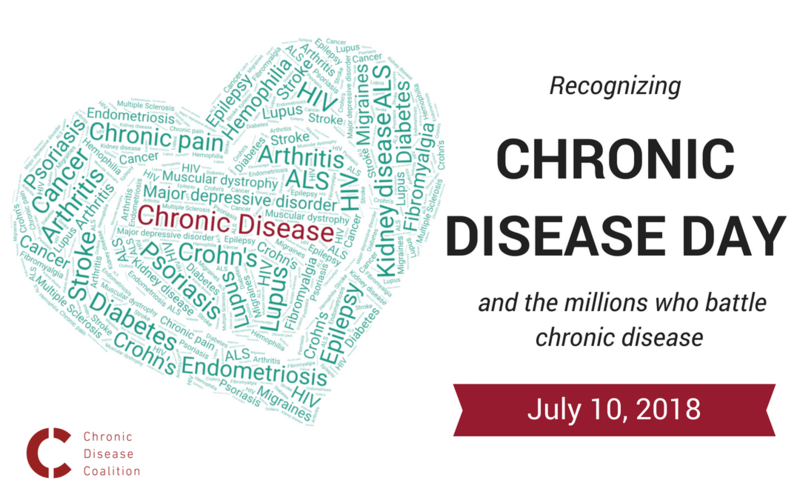 Across the country, communities, cities and state are recognizing July 10 as Chronic Disease Day and joining the broader public discussion on chronic disease awareness. Today, we support the millions of Americans who battle one or more chronic diseases and reflect on the impact chronic health conditions have on our friends, family and society. Nearly 133 million Americans are currently battling a chronic health condition such as diabetes, lupus, arthritis or multiple sclerosis, and the number continues to rapidly grow. By 2020, an estimated 157 million Americans will battle one or more chronic conditions. Chronic Disease Day takes place on July 10 every year to raise awareness that seven out of 10 individuals in the United States will lose their life to a chronic condition like cardiovascular disease, diabetes, cancer and others. Many chronic conditions are inherited or develop for unknown reasons, which is why it is vital to use Chronic Disease Day as a platform to educate, discuss the issues, promote self-care practices and engage your community to develop solutions. Patients battling chronic disease understand that each person is affected by chronic disease differently and may face significant challenges when accessing care or even explaining their condition to friends and family. Often, a patient’s condition remains invisible to the public, which can prolong the time it takes to receive a diagnosis and lead to unaccommodating coworkers, teachers or even loved ones. Whether in the workplace, school or with a health plan, patients with chronic conditions are regularly forced to battle for access to appropriate resources or even lifesaving treatment. Amidst all of this, it can be difficult for people to adapt to a new lifestyle that is often required to more effectively manage their condition. Despite medical advances, many treatments can leave patients feeling tired, overwhelmed or better in some regards but still dealing with other symptoms. As a result, patients are left to make personal sacrifices when it comes to spending time with loved ones and engaging in activity. Today, we ask you all to take a moment and share information about the disease you battle or the experiences you have had with others. This simple action will go a long way in ensuring that the public becomes more aware and equipped to support those with chronic conditions.